When I was nine years old, my family moved from a suburb of Los Angeles to a remote mountain town of two thousand people, one hundred miles from everything I knew. I was never terribly outgoing, but was fortunate enough to become quick friends with a boy in my fourth grade class. I often went to sleep over at his house, and I remember hearing his older sister, a young singer on whom I had something of a crush, singing the chorus of a song I didn't know, over and over again for several months. No matter how many times I heard her belting "And IIIIIIIIIIIIIIIIIIIIIIIIIIIIIIIIIIIII will always love youuuuuuuuuuuuuuuuuuuuuu" I never tired of it (unlike the rest of the family, who although thoroughly supportive admittedly had to put up with much more than I). It was years before I learned about the context of the song and the superstar who made it enormously famous, but I recognized the incredible power of a legendary performance long before hearing it first-hand. Some years later, a friend of mine, whose father was a member of the motion picture academy but had no interest (or so I was told) of voting for the Oscars, let me help her with that year's nomination ballot for Best Picture. I was obsessed with the Academy Awards, and it was one of the more thrilling moments of my childhood. I don't remember what films we nominated with the exception of our (my) first choice: The Preacher's Wife. I'm pretty sure it was the only ballot with that film at the top, but I certainly didn't know that at the time, nor would I likely have cared. I was enthralled by the movie and especially by its star, Whitney Houston. I was just becoming exposed to pop music through friends and on the radio, and as someone raised on Ella Fitzgerald, James Taylor, Michael Feinstein, and a dash or two of jazz-mode Bette Midler, I had never heard anything like that film's soaring power ballad, "I Believe In You and Me." I was so enraptured by the song that I bought the soundtrack; I'm not certain, but it might have been the first CD I ever bought with my own money. I especially lived for the climactic verse, where Houston let rip her famously clandestine high notes (my dad would say she had "great pipes"), and my heart would quicken every time I reached the bridge that I I knew signaled the imminent finale. "Maybe I'm a fool/ To feel the way I do/ But I would play the fool forever/ Just to be with you forever." I couldn't possibly have grasped the meaning of those words then, although I certainly do now. 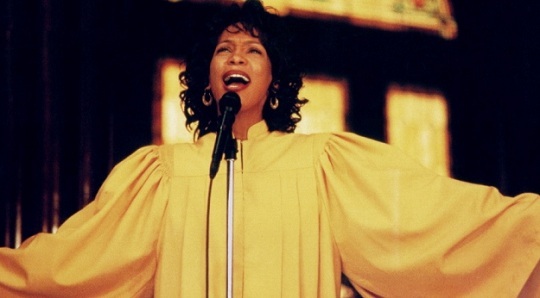 Though Whitney Houston's career faded soon afterward as the singer became increasingly embroiled in her battle with abuse and addiction, there were a couple more instances in my life in which I felt her impact. There was the lovely night my entire family gathered to watch the return of The Wonderful World of Disney on ABC, featuring a new version of Rodgers and Hammerstein's Cinderella starring Brandy, co-starring and produced by Houston (she played the fairy godmother). My mother had spoken nostalgically about watching the original telecast starring Lesley Ann Warren, and my parents sang along with Brandy and Whitney to "Impossible." Like many white kids growing up in the '90s, I was both fascinated and a little scared by R&B and hip-hop, and I was intrigued by the subtle elements of pop and R&B that slipped into the music: the bass line on "In My Own Little Corner," or the way Houston sang on, over, and around her notes (without going overboard). Many years later, after I'd graduated college and moved to London for a graduate program, I began growing increasingly sick with a serious illness that ultimately forced me to return home early and from which it took several years to fully recover. Music was one of the only ways I kept my spirits up in that frightening time, and a few of my benevolent classmates, who did their best to help me as my health declined, occasionally had to put up with me belting out the famous climactic key change from "I Will Always Love You," just as my friend and his family had done fifteen years earlier with their own resident chanteuse. If anyone had asked me to name my main inspirations as a musician and eventual music writer, I probably wouldn't have mentioned Whitney Houston among them. Maybe because her years of activity as one of the seminal singers of the era were a bit before my time and she was not a contemporary presence in the years since I became engulfed in pop music in the mid-'90s, her impact was never as immediately apparent to me as that of Alanis Morissette, No Doubt, Britney Spears, Shania Twain, or TLC. Maybe it's because her influence came via formats (power ballads, musical theater) that didn't stay with me as much as others. Maybe it's because to this day I only know a half dozen or so of her songs, much less own them. Yet when I think back to the first time I felt captivated by a song or a singer in the intoxicating way that has led me to seek a career in music writing, I'll be damned if it wasn't Whitney Houston. "I was lost; now I'm free." Rest in peace, Ms. Houston, and thank you.